Our original interview was released in 2016 and replaced with this update. Don’t miss this important episode in the Learn & Grow Series. 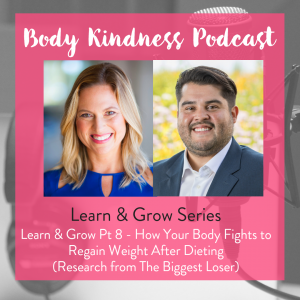 We talk about one of the longest studies on weight cycling and dieting — a study that followed the Biggest Loser contestants from Season 8 for six years. I help Bernie understand the outcomes of the journal article and how he can make peace with his experiences and move forward with body kindness instead of dieting. their resting metabolisms had permanently slowed, burning an average 500 fewer calories a day than other people their age and size they had significantly lower levels of leptin, the body’s satiety hormone. A heads up: in this episode Bernie discusses his temporary weight loss and excessive efforts on The Biggest Loser. So take care of yourself when deciding to listen. My hope is that our collective anger will feel like a salve to the wounds of chronic dieting and body shame. It’s available wherever good books and audiobooks are sold. Order signed copies and bulk discounts here. Thanks to our generous podcast supporters! We’re working toward our goal to fund the full season. Can you donate? Please visit our Go Fund Me page. 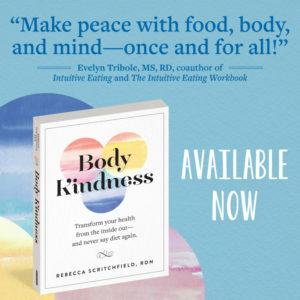 Get started with Body Kindness for free! Sign up here to get started and stay up to date on the latest offerings. Check out BodyKindnessBook.com/breakthrough for the latest groups and individual support sessions. Continue the conversation and chat to fellow podcast listeners on the Body Kindness Facebook group. See you there! We’re on iTunes, Stitcher and iHeartRadio, or follow us on Spotify. Enjoy the show? Please rate it on iTunes! Nothing in on the Body Kindness blog or podcast is meant to provide medical diagnosis, treatment, cure, or prevent any disease or condition. Individuals should consult a qualified healthcare provider for medical advice and answers to personal health questions. I’m so glad you’re here. 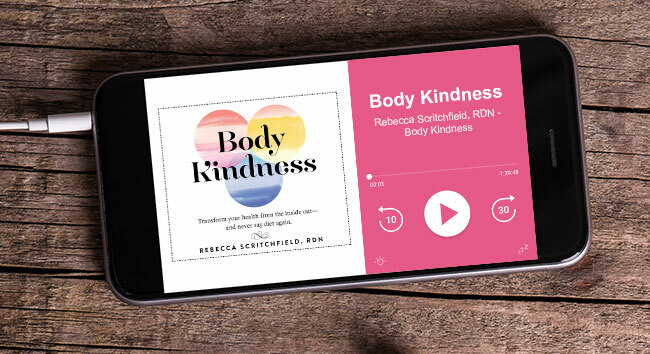 You can now get Body Kindness® wherever books and audiobooks are sold! Grab my free web-based program, Start Body Kindness, here. Get my free digital training and start treating your body with more kindness today!